As some researchers would sit back and continue there work without giving such a lack of interest much thought. I felt that to make a difference these users experiences and challenges when using web technology needed to be brought to the attention of the a11y community. Conveniently (or maybe fate) on a mid-January sunday evening a tweet containing a #a11ybos hash tag appeared in my twitter timeline; being my usual self “nosey” I tweeted its creator @Jennison for a description of the hashtag. I was informed that it was an a11y unconference taking place in Boston, U.S. on the 15th May 2010 . According to Wikipedia an “unconference is a facilitated, participant-driven conference centered on a theme or purpose. The term “unconference” has been applied, or self-applied, to a wide range of gatherings that try to avoid one or more aspects of a conventional conference, such as high fees and sponsored presentations” . I was intrigued by such an event and thought this could be the platform to engage the a11y community. So I tweeted to see if anyone was considering doing such an event in London. Over a space of a week I received lots of responses, however they were not as expected. Most tweets took the view of: thats a brilliant idea, when and where is it going to be?, it appeared that I had put myself forward as coordinator. My response to this was I’m unsure if I can do this, will I have the time etc. However, I have never been one to walk away from a challenge. So, after many tweets, DM’s and informal meetings with fellow a11y folk, #a11yLDN aka Web Accessibility London was born . Within days Twitter lists were created: a11yLDN and a11yLDN-Organizers; along with a Google group to encourage discussions and post ideas . The meetings began on 11th March at @cinteractionlab, after which the official @a11yLDN twitter account was created. In total there were six 1.5 hour meetings where all aspects of a11yLDN were discussed especially its motor impairment theme. It was agreed the unconference would focus on web accessibility from the perspective of users with motor impairments however it would also consider issues of cognitive impairment and the wider disability population. With help from Jim O’Donnell, Alison Smith, Graham Armfield, Raj Arjan, Janet Stollery, Angela Kounkou, Doria Pilling and Helena Sustar , I was able to launch free ticket sales on 21st July  and shortly after the official website . From that point, time appeared to speed up, tickets were sold out within 8 days and in under 2 weeks over half of the presentation slots were taken. My attention was then turned to sponsorship, thankfully City University London offered their Northampton Square College Building as a venue and Pesky People, Talk About Local and Coolfields sponsorship allowed for a “light lunch” (those who attended should get the joke) and other overhead costs – I cannot express how grateful I am. Well… the 21st september 2010 came and with less than 2 hours stress induced sleep the unconference was here. There were over 60 attendees from all over London, UK and even a few from the EU. Talks and workshops were vast and well attended, starting with an introduction to accessibility and motor impairments by Graham Armfield and I, followed by 5 slots offering short presentations and long discussions including: Karen Mardah’s “Technical Communication and Inclusion”; Jamie Knight’s “My iPad, Talking to me and for me”; Martin Kliehm’s “Of Unicorns and Alligators – HTML5 Accessibility”; Léonie Watson and Artur Ortega’s “Discovering the world of modern screen readers”; and a web panel by Ian Pouncey, Jim O’Donnell & Sandi Wassmer “Inclusive Design, Accessibility & Open Web Standards”, plus many more. In total 14 talks were given by well establish a11y folk, and a @cinterationlab tour was offered by Raj Arjan. A full list of the days events can be found at: http://a11yldn.org.uk/time-and-location. A 1-day event that will have a motor impairment theme, as it is believed they are a widely under-represented population within web accessibility. However, the unconference will also consider cognitive impairments and the wider-disability population. The event will be structured with short presentations and workshops that have ‘longer’ discussions, i.e. a place for people to learn from each other. It is directed at end-users, web designers and developers (web accessibility and UX), editors and authors, accessibility specialists, universities and companies, charities and more specifically the movers and shakers of web accessibility. Finally, over the last couple of weeks a few people have asked me for advice in organizing unconferences in other cities and countries, well here’s my answer: 1) unconferences are stressful but reaching out to your field in this case the a11y community is invaluable, so please do not attempt it alone; 2) using a creative approach e.g. post sticks and boards in meetings can easily encourage discussions and engagement; 3) embrace social media e.g. Twitter, LinkedIn, Facebook etc. as they can encourage participation from far a field, however please do not focus solely on these methods as face to face communication can often iron out issues quicker; 4) things usually go wrong so try to plan for every eventuality but remember nothing is ever perfect we are human after all and we have the ability to learn from our mistakes; and finally 5) choose a subject that you are passionate about as it will take up a lot of your time. I end this blog with some good news 🙂 following feedback given via the a11yLDN feedback webpage, twitter, in-person and email, I am pleased to announce that this is not the end of a11yLDN. 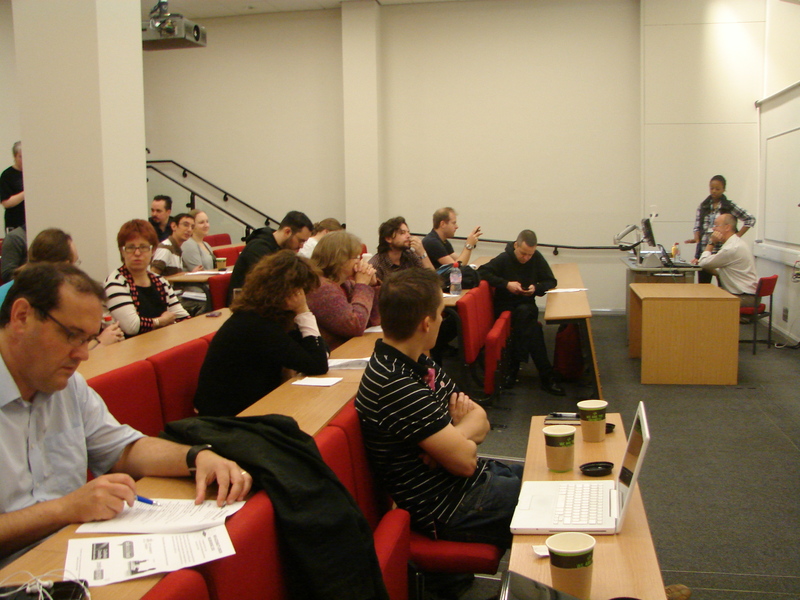 It is to become an annual unconference and the next is scheduled for September 2011 (further information to follow). I look forward to watching the a11y unconference movement spread. See you at @a11yLDN 2011!